1. In a shallow dish, mix vinegar, broth, garlic, sugar, oregano and basil. 2. 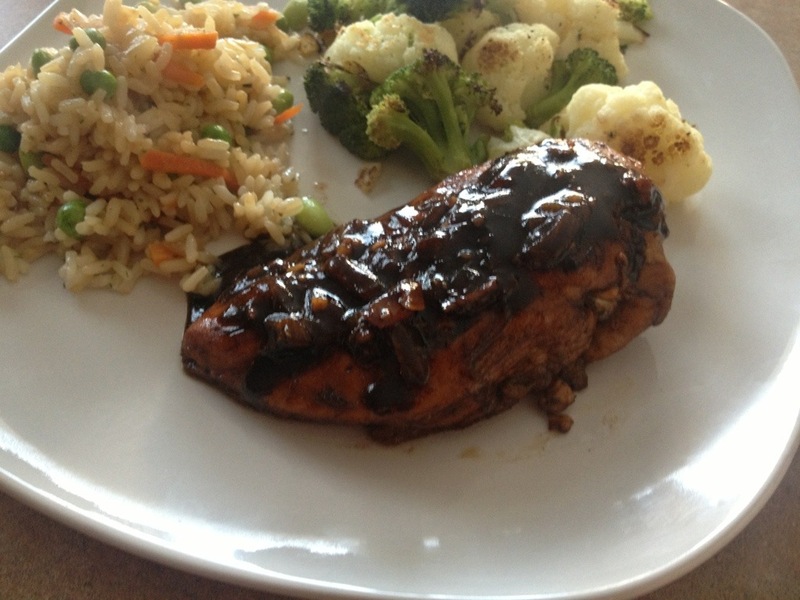 Marinate chicken breasts 20 min to 6 hrs in this liquid. 3. Heat oil in a large skillet, and remove chicken from marinade, but don’t throw the marinade out. 4. Cook the chicken in the skillet, approximately 8 min per side, turning as needed. Cook until chicken is done all the way through. 5. Meanwhile, in a small saucepan being onion and remaining marinade to a boil, whisking regularly. 6. Continue whisking mixture, but turn heat down to about medium. 7. Once chicken is cooked through, add sauce into skillet. 8. Cook down until sauce thickens to desired consistency. 9. Whisk in a pinch of corn starch if sauce does not thicken to your liking. Serve chicken with sauce spooned over top. I spent a long time in my life believing that I hated hummus. In fact, i spent 10 years as a vegetarian who hated hummus, which was interesting, because that’s what everyone thought I should be eating. But I tried it once, and it was terrible. 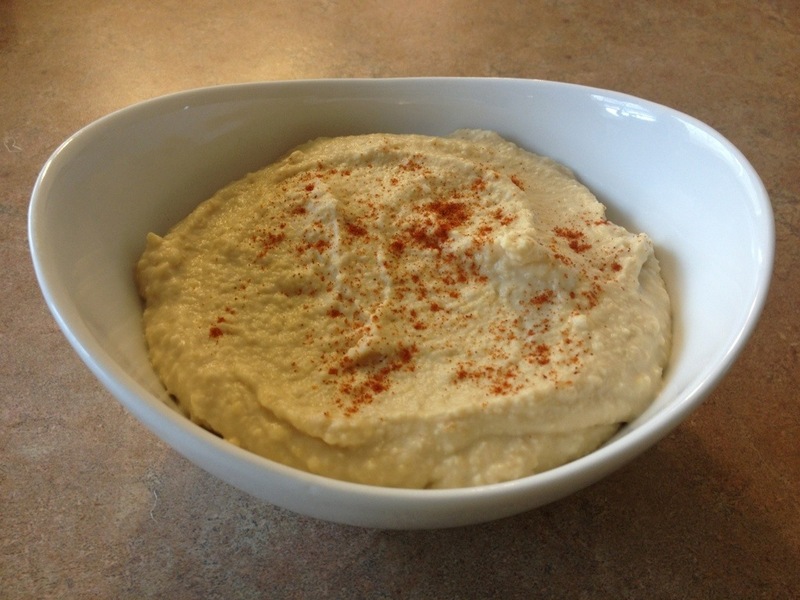 Turns out, I just had a bad hummus… because 15 years later, I tried it again, and fell in love. I was able to lower the calories significantly from a store bought hummus, by omitting the olive oil, and using about 1/2 the tahini. My favorite way to eat it is on sliced cucumbers. 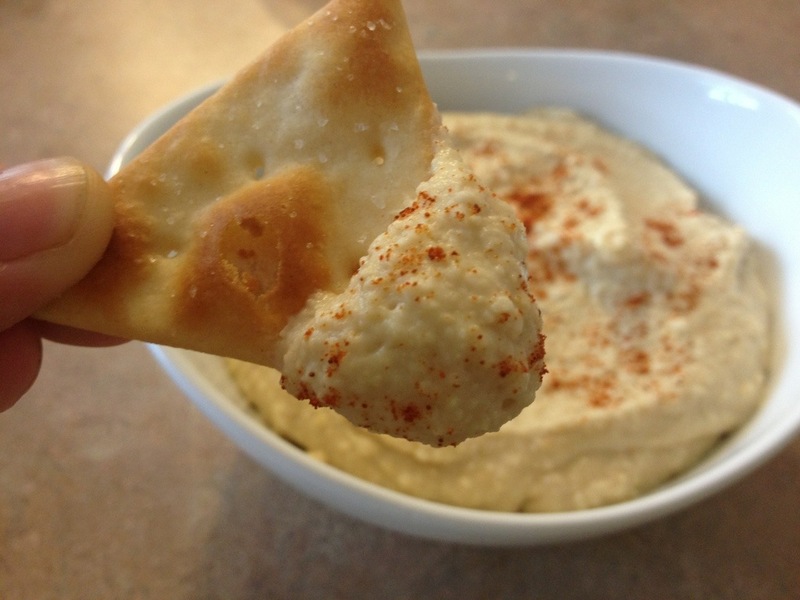 That allows me to have more hummus, since the vessel is super-low in calories! 1. Pay attention folks. The directions for this one are intense. 2 See all that stuff up there in the “Ingredients” list? Throw it all in the food processor, and grind it all down until you are happy with the texture. For me, that meant “until i could no longer stand the sound of the food processor” but I have a bit of sensory sensitivity… Add a little more water if it’s too think. You may need to stop now and then to scrape the edges. Makes 1 1/2 cups of hummus. This is based off a recipe I found on Pinterest. I made a few changes to make it lower calorie and also to my taste. This was very good. If you like banana peppers, it gets a tad salty, but nobody else in my family ate the banana peppers… And they all still loved it. Will be a repeat for sure. 1. Slice sausage at a slant (on the bias) into slices about 1/4 in thick. 2. Cut new potatoes into cubes about 1/2 in x 1/2 inch. Don’t make them too big or they won’t cook through. 3. 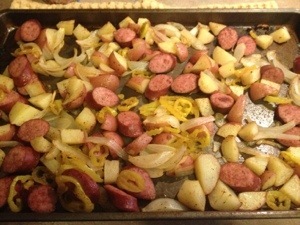 Place sausage, onion, potatoes and peppers in a large bowl and drizzle with olive oil. 4. Sprinkle creole seasoning over mixture and mix it all together, coating each piece with a little oil. 5. Spread mixture evenly over a baking pan sprayed with nonstick spray. Use a pan with sides, not a flat sheet. 6. Bake mixture at 400 for 35 min, turning all items over once halfway through cooking. 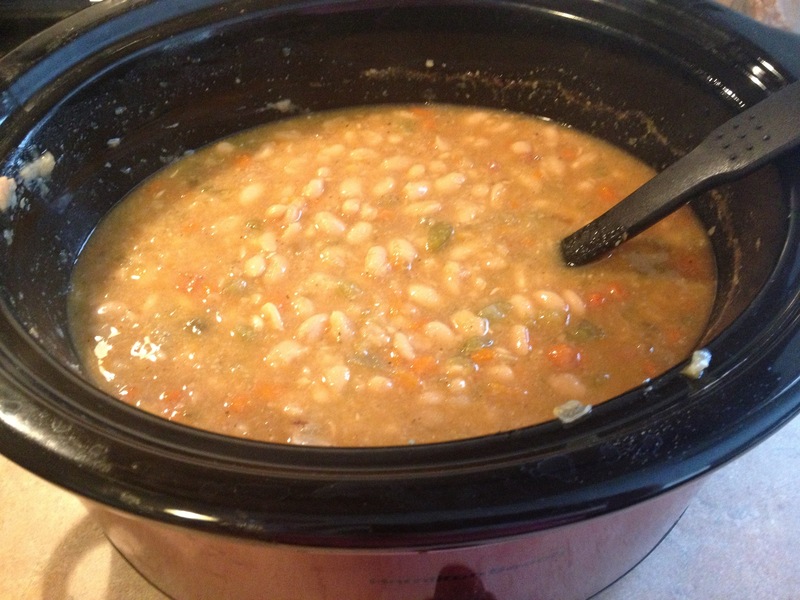 I am a southern girl (which you probably know by now if you follow this blog) and I love bean soup. So does my 15 yr old, and he requested it this week, so, who am I to say no!! I’ve tried many times to make it in the crock pot, because it seems like a great fit… but for whatever reason, it never really worked… until last night! 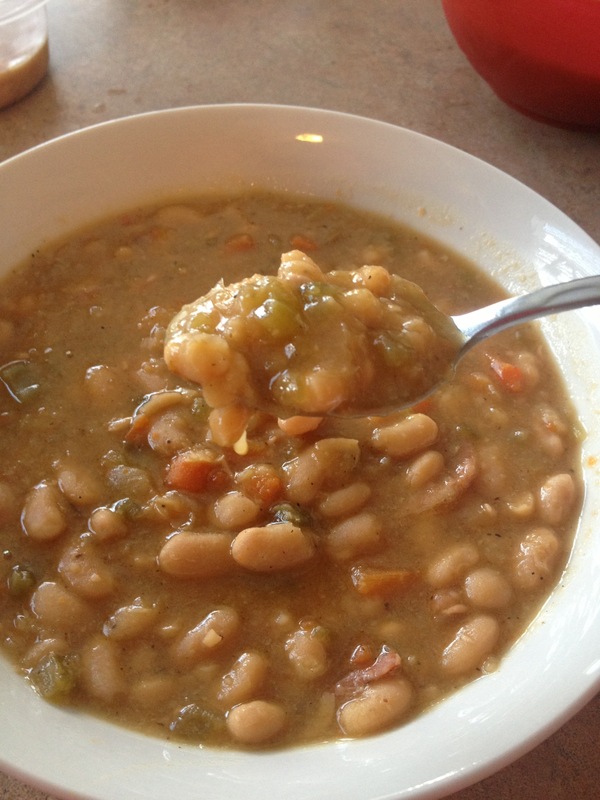 Below is a pretty delicious, filling, and low calorie classic southern white bean soup. It takes a little more prep time than I normally put into a crockpot meal, but honestly, I did everything the night before, except add the beans. I stored the rest of the soup mixture in the fridge overnight, and cleaned and sorted the beans, and set them aside on the counter. Then in the morning, I mixed the dried beans in and started the crockpot. It was yummy! For an extra 170 calories, I served it with one prepared jiffy corn bread muffin. mmm…… that deserves another one…. say it with me…. “mmmmmmm……” Enjoy! 1. On the stove top, heat oil in a medium sized skillet. Add some non-stick spray if you need more than just the 1/2 tbsp of oil. 2. Add the onions, celery, and carrots to the pan. Heat them in the oil, stirring regularly, until the veggies begin to soften a big. Onions may turn semi-translucent. 3. Transfer veggie mixture to the empty crock pot. Add everything else on the list to the crock pot, except the beans. Don’t add the beans yet. 4. Use a strainer to rinse your beans thoroughly. Sort through the beans while cleaning them, and discard any beans that are discolored, shriveled, or broken. Be sure to rinse them well. Occassionaly you might find a pebble in there. Remove that too 🙂 they’re hard to digest. 5. See all those steps up there ^^ I did all those the night before, and then stored my beans on the counter, and the remaining soup mixture in the fridge, over night. Don’t soak your beans…. just rinse them, drain the water, and set them aside. If you’re doing this all in the same day, then you can go ahead and add your beans at this point. If you prep the night before like me, then just stir the beans in when you’re ready to start cooking! 6. Stir the beans into the mixture, and heat on low for about 8 hours, upto 10. Editors Note: I also remove about 1/4 cup of the country ham from the hamhock, chop it up, and add it back into the soup. Again, up to you. Southern girls don’t pass up country ham when they have the chance to eat it. 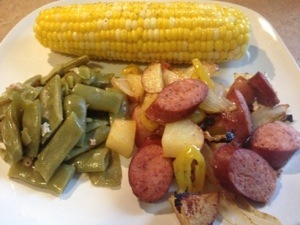 This easy side item was delicious! I really liked the last minute addition of sun dried tomatoes. I hope you like it. Can’t wait to serve it with a nice grilled chicken or fish! 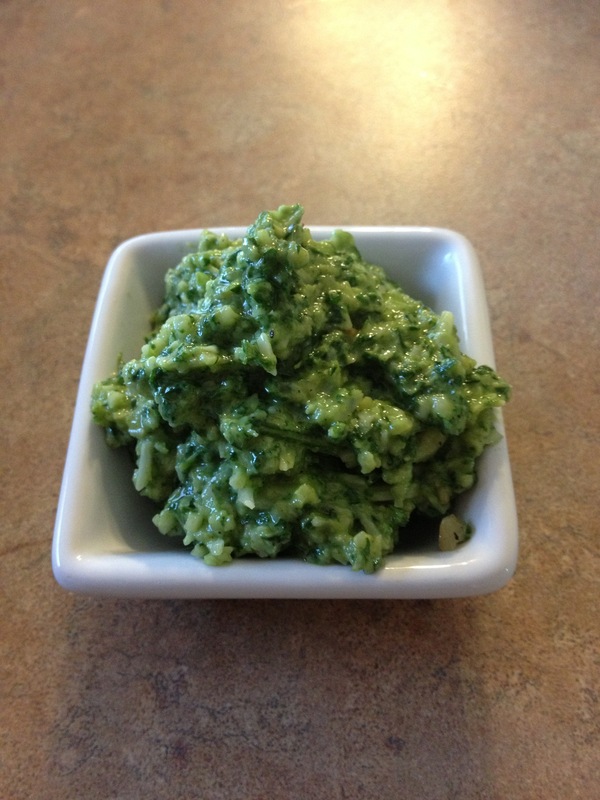 If you want the Calorie Content, recipe, etc for Just the Pesto, click here. 1. Place everything but the Olive oil into the food processor. You’ll want to use a small food processor, and you may need to scrape the sides down periodically to continue blending. Due to the small portion size, the pesto may collect around the edges of the food processor. 2. Once all other ingredients are well blended, add Olive oil and pulse until all ingredients are smooth. Your Pesto is done! 3. 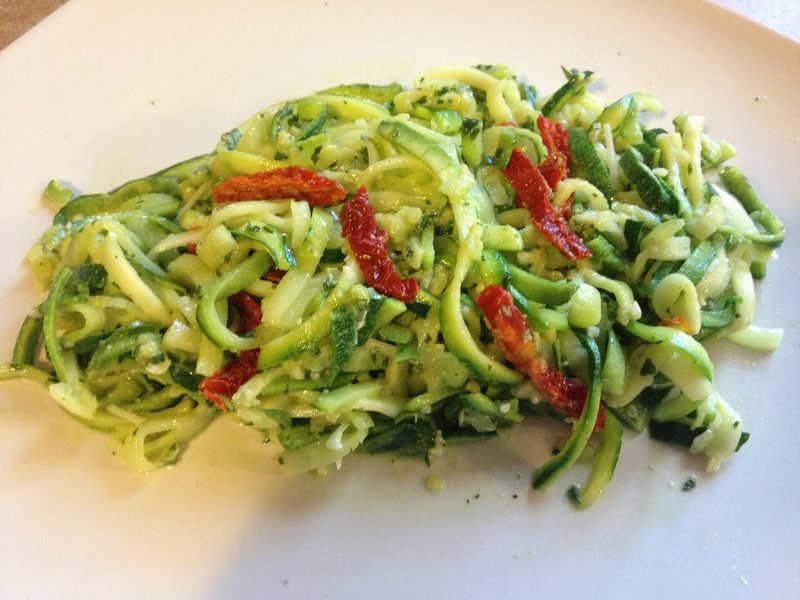 Use a Mandolin or other julienne tool (I used a Vegetti) to slice your zucchini into strands (resembling noodles). 4. Heat the 1 Tbsp Olive oil in a skillet. Add Zucchini and sautee 3-5 minutes. 5. Season Zucchini with sea salt, and mix in Pesto and Tomatoes. So, I grew a couple things in my yard, for the first time this year! Basil, and Cilantro 🙂 Tragically, the Cilantro did not make it. But the Basil did GREAT, and led to this lovely Pesto, which I served with Zucchini noodles 🙂 YUM. A couple of notes: Pesto is very caloric, so I made a small batch full of rich flavor, to use in combination with a very low-calorie alternative to pasta. It was delicious. Because a little goes a long way, I recommend this pesto as a compliment to grilled chicken, or a lovely side dish. One last thing. Traditionally, pesto is made with pine nuts. but I chose almonds because they are lower in calories, and lend the same nutty flavor to the dish. 2. Once all other ingredients are well blended, add Olive oil and pulse until all ingredients are smooth. Approximately 3 weight watchers points plus per serving. 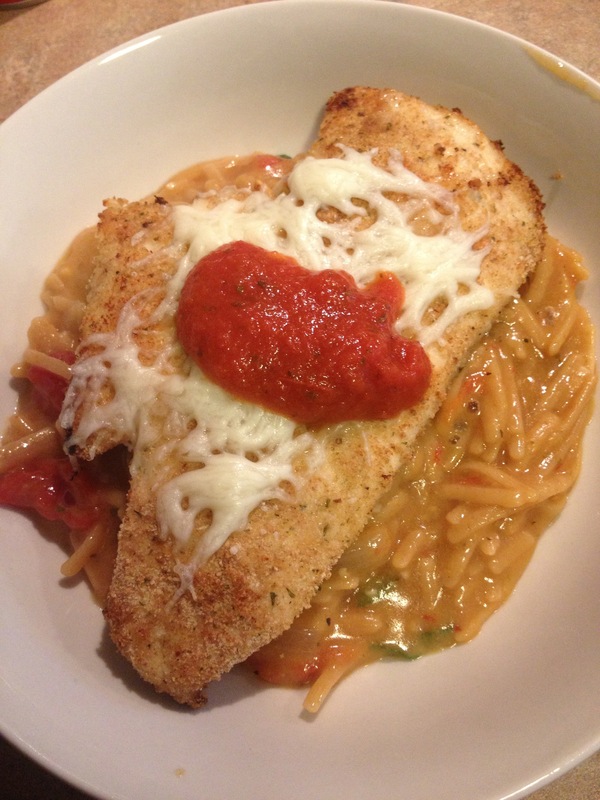 Chicken Parm is one of my favorite “full fat” meals to make. Turns out, making it in the oven is almost the same. I’m not sure why I didn’t do this sooner! So, in the picture here, I served this with a different kind of pasta (which i wasn’t crazy about, so I didn’t post the recipe). The calories below are calculated using whole wheat pasta and marinara sauce. 2. Pour water into a shallow dish, and mix bread crumbs, garlic and parmesan in a separate shallow dish. 3. Dip each chicken cutlet in water, and then in breadcrumb mixture, covering on both sides. 4. Place chicken breasts on a baking pan, sprayed with nonstick spray. 5. 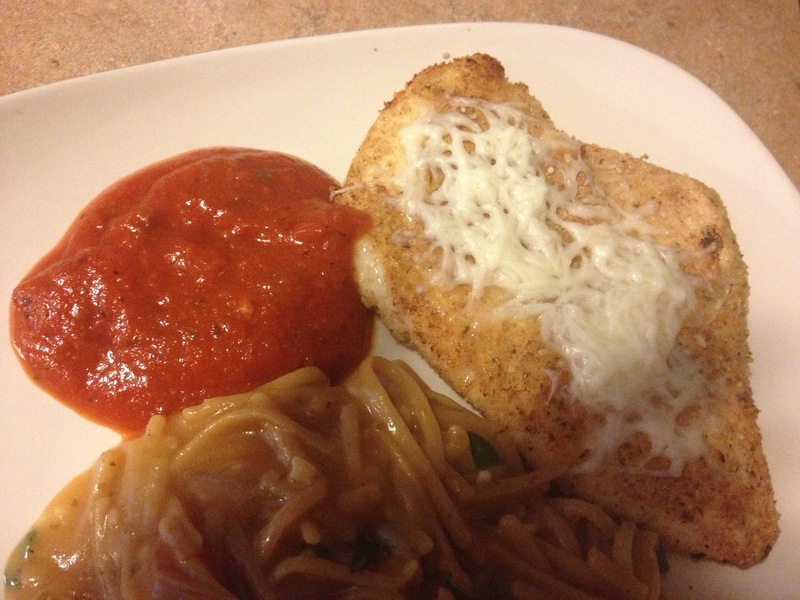 If there are left over crumbs in the dish, sprinkle them over the chicken breasts. Spray tops of chicken breasts lightly with olive oil flavored non-stick spray. 6. Bake chicken for 10 min at 450. After 10 min, flip chicken breasts over, and turn oven to broil. Broil Chicken until tops are browned. 7. 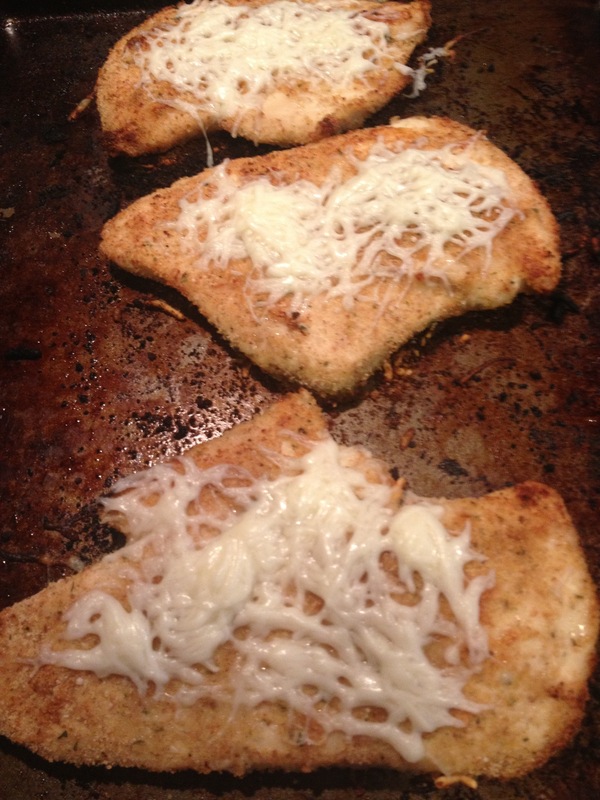 Sprinkle Chicken with 2 tbsp each of mozzarella cheese, and return to oven just long enough to melt cheese.